This is a wonderful and creative EBook by JES of the Strangers and Pilgrims On Earth website. 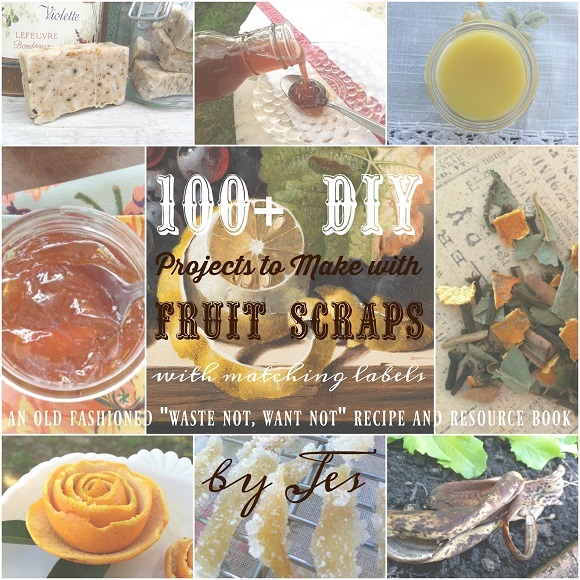 In this 264 page book, she shares over 100 of her personal recipes and tutorials for beauty, cleaning, health, home and food projects using fruit peels and scraps. The subtitle is An Old Fashioned “Waste Not, Want Not” Recipe and Resource Books. Included in the book are photographs and printable labels for each recipe. I’ve shared recipes and tutorials by JES for years because of their originality and value. So I was really excited when I saw that she had written a book! All of the recipes in this book are completely natural. They’re made with fruit peels that are either dried, used to infuse glycerin, oil, or vinegar or used in tinctures or extracts. You don’t have to add expensive essential oils, although you can if you want to. Recipes include balms, bath salts, perfume, scrubs, easy to make fancy soaps, facial products, potpourris, room sprays, sachets, muffins, candy, syrups, shrubs, desserts, healthy and delicious beverages, medicinal oil blends, salves, tonics, digestive aids, health supplements, snacks, seasoning and spice mixes, tea blends, homemade vinegars, recipes for canning syrups and jelly, herbal honey, and much more! Finally, JES has reasonably priced the book at $9.99. So you get a huge amount of value for the price. This section includes a variety of creative ways to use the most common fruit scraps.